Origin and Habitat: Garden origin (Nursery produced cultivar). The original natural habitat of this species is recorded from southern slopes of the Swartberg and Anysberg in the Western Cape karoo. 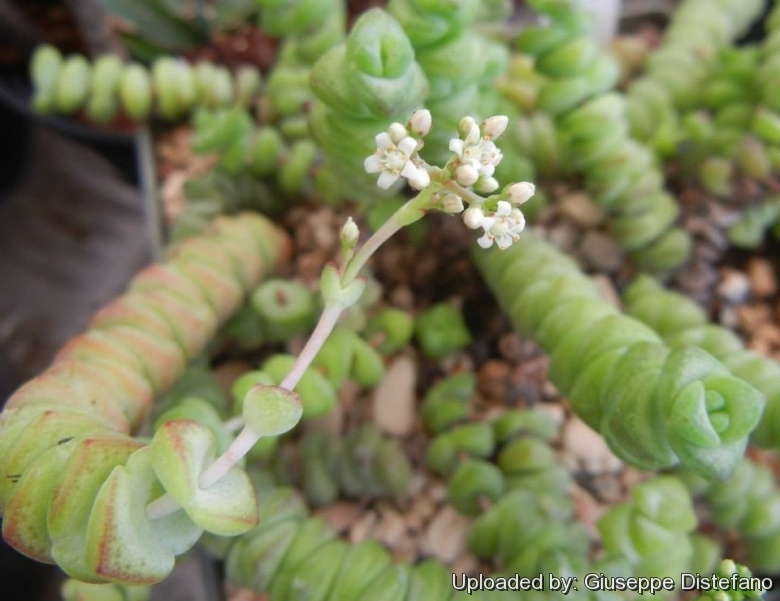 Description: Crassula rupestris subsp. marnieriana is an interesting slow-growing dwarf cascading form distinguished from the standard Crassula rupestris by the small much-fused leaves that are so close together that the stems appear columnar. Produces dense heads of many mall star-shaped pink-tinged flowers in winter if they are given proper conditions of temperature. Crassula rupestris subsp. marnieriana cv. contorta: This cultivars has semi-erect or decumbent, rooting stems thickly covered with leaves reaching a height of 15–20 cm. These stems are not linear cylindrical like in the standard type but variously twisted, bent and gnarled. Leaves: Sessile broadly thick, cordate-orbicular in outline about 4 cm long and 8 mm broad green with red edges. Leaves are tightly stacked along the stem and store water, as they are covered with a cuticle to limit the evaporation and will turn purple in sun. Inflorescences (thyrses): At the ends of the branches on mature plants, short-stalked, rounded. Peduncle up to 20 mm long and partly hidden by upper leaves, with spreading bracts at least 3 mm long at base of inflorescence. Flowers: White or pinkish. Pedicels glabrous of a purplish colour. Calyx lobes narrowly to broadly triangular, c. 1 mm long, pointed, glabrous, fleshy, glaucous-green often tinged red. Corolla tubular, fused basally for 0,4-0,6 mm, white and more or less tinged pink or red. Stamens with brown anthers. Squamae oblong to square, 0,4-0,9 x 0,3-0,6 mm, usually truncate, rarely somewhat cuneate, fleshy yellow. Crassula rupestris L.f.: has erect, spreading or decumbent stems up to 500 mm long; leaves brownish-purple with red or yellow margin. Distribution: West to the Fish River valley in the E. Cape. Crassula rupestris subs. commutata (Friedrich) Toelken: has leaves less than 4 mm, scarcely fused, internodes visible, stems not rooting when reaching the ground. Distribution: mountains of the lower Orange River. Crassula rupestris subs. marnieriana (Huber & H.Jacobsen) Toelken: has rooting, dwarf stems with leaves so close together that the stems appear columnar. Distribution: Swartberg and Anysberg in the Western Cape karoo. Crassula rupestris subs. marnieriana cv. Contorta: has stems not linear cylindrical like in the standard type but variously twisted, bent and gnarled. 10) Toelken, H.R. 1997. “A revision of the genus Crassula” in southern Africa. Annals of the Bolus Herbarium 8,1-595. Cultivation and Propagation: Crassula rupestris subsp. marnierana are of easy cultivation and relatively low maintenance, which makes them a good houseplant, and can be an excellent subject for the beginning succulentophile (they can grow easily on window sills, verandas and in miniature succulent gardens where they are happy to share their habitat with other smaller succulent plants, or in outdoor rockeries). They are spring and autumn grower (summer dormant). It can be grown as a hanging basket subject or as a ground cover. Soil: They prefer a very porous potting mix to increase drainage. A acid soil is ideal. You can grow a plant in a 6-10 cm pot for years and have perfectly happy plants. For best results, use a shallow pot. Watering: Provide some water all year around, in the wild most of the growth occurs during spring and autumn. During the hot summer months, the soil should be kept moist but not overly wet. During the winter months, water only when the soil becomes completely dry. Wet soil quickly causes root and stem rot, especially during chilly winter months, but can re-root if taken care of. No water should ever be allowed to stand around the roots. Low ambient humidity is always needed. Sun Exposure: They need full sun or bright, filtered light with ample airflow to stay compact, but avoid direct blasting sun in mid summer (with sun exposure the leaf develops a nice brownish tint), they do not do well in full shade as they tend to etiolate, fall over and rot easily. Pruning: Remove dead ﬂower spikes only. Propagation: They are easily propagated by the removal of off shoots, remove a lateral shoot and insert the basal part buried in the soil. This shoot should root within a month, and small offshootd will form at the base. They can also be grown from seed.